We’d love your help. Let us know what’s wrong with this preview of Memoirs of a Goldfish by Devin Scillian. A personal account from a goldfish on life in his bowl as other intruders crowd him. To ask other readers questions about Memoirs of a Goldfish, please sign up. is it a good memoir? Take this opportunity to spend two weeks in the life of a goldfish. Our fish is just getting used to his bowl when some other suspicious characters start showing up. Before you know it, the place is just swimming with interlopers, and our hero is screaming for a little alone time. But, when he gets his wish, he's not sure that's what he wanted after all. A very cute story, made all the more memorable by Tim Bowers' terrific artwork. I love this picture book. It’s one of those books that can be enjoyed by readers/listeners of all ages, each person taking in the story in different ways. It’s adorable and poignant, and often wildly amusing. This is a just for fun book, but it could work really well as a bibliotherapy book too. It’s silly but there is room here for much discussion about serious issues too. It’s a fabulous read aloud book and wonderful for independent readers too. The illustrations are outstanding. Their expressive I love this picture book. It’s one of those books that can be enjoyed by readers/listeners of all ages, each person taking in the story in different ways. The illustrations are outstanding. Their expressiveness is a riot, and the colors and detail are so eye-catching. They are a perfect fit for the story. Cute story that makes a great read aloud. Will serve as a mentor text when teaching memoir and personal narrative. This story, as the title suggests, is the memoir of a fish. It starts out simply: "Day One: I swam around my bowl. Day Two: I swam around my bowl. Twice." But things don't stay that simple in the life of this fish. He soon gets some company, and things start to get complicated pretty quickly. I don't believe I've ever seen Tim Bowers' illustrations before, but I absolutely love them! They are just so warm and inviting. And I love all the expressions on the face of the fish - mostly it's the eyes. This story, as the title suggests, is the memoir of a fish. It starts out simply: "Day One: I swam around my bowl. Day Two: I swam around my bowl. Twice." But things don't stay that simple in the life of this fish. He soon gets some company, and things start to get complicated pretty quickly. I don't believe I've ever seen Tim Bowers' illustrations before, but I absolutely love them! They are just so warm and inviting. And I love all the expressions on the face of the fish - mostly it's the eyes. So expressive! Very fun! I'm going to read this one to my library classes next week as we talk about plot. I expect it to be a big hit. I absolutely adore this book. Humorous and teaches a lesson about sharing with other people. I particularly love Mervin, what a great name for a snail! The illustrations are simple, clean, fun, and beautiful. I am LOVING these books!!!! A little surreal, in a good way. Good, because that subtle note makes it all the more appealing for all ages and for frequent rereads. Important themes included, but they're almost hidden by the exuberant art and funny storyline. Also, I agree with other reviewers who suggest it as a mentor text. And I'm glad I picked up the two sequels that my library had next to it. Silly and sweet on how fish's tank gets a bit too crowded. I read this yesterday with some third graders. The story of an increasingly frustrated and desperate fish who gets his wish only to wind up bored and lonely is adorable. It's also a great book to get into character for, which the kids love. A lot can happen in a fort-night as a goldfish shares his memoirs of how he went from having the fishbowl to himself to gaining not just a community but a family. A picture walk is a pre-reading strategy that allows the student to become familiar with the book before reading it. By looking at the pictures, the student is free to form hypotheses about the story and personally connect with the visuals of the book. When selecting a book for a picture walk, meaningful pictures are important to engage the student. The person facilitating the picture walk may ask prompting questions as the student flips through the book (note: it is not necessarily imperative that the student reflects on each picture/page of the book while doing a picture walk). This is done in an effort to help the student connect the visual that is on the page with the text that they will be exposed to when the book reading takes place. An additional purpose of the picture walk is to demonstrate that books are not only words on pages, but places where visual representations exist, which can evoke meaning and action. I chose to engage my readers with a picture walk for this story. The faces of the fish are very expressive, and I thought that it could be a good opportunity to discuss modal words with my clients. One of the purposes of a picture walk is to gain an understanding of how children interpret visual images. Speech-language pathologists could use the picture walk pre-reading strategy to serve as an assessment of this. Because the picture walk does not involve reading the actual text, children can make up their own story involving the images, connecting the illustrations to situations in their own lives (text to self). Script: May use less, depending on how engaged the reader is. Alison: Hello! I'm so excited to see you today, I have an activity planned that I'm so excited to share with you! Alison: We're going to read a story called Memoirs of a Goldfish. Before we read it though, we're going to look at all of the pictures and talk about them. Alison: Let's look at the cover. Alison: Do you want to turn the page? Let's start at the beginning. Alison: Have you ever had a pet goldfish? I had one named Colada when I was about your age. She loved to swim. Alison: Look at his face here! (Day 3 in the text, p. 4). How might he be feeling based on his expression? Alison: Look, now there's more in the bowl! How do you think the fish likes it? How can you tell? Alison: Oh my gosh, a crab! Do you think they'll become friends? Summary: Memoirs Of a Goldfish written by Devin Scillian is charming story told through the goldfish'scomments. A goldfish in his bowl alone, counting the number of times h swims around in his bowl. Day one, two, and three passes and to his surprise he gets some company. A deep see diver that is actually bubbler. This intruder is weird, creepy, and doesnt speak much thought the goldfish. The next day plants, a snail, a blue crab, and other fishes join the goldfis in his once lonley bowl. The gol Summary: Memoirs Of a Goldfish written by Devin Scillian is charming story told through the goldfish'scomments. A goldfish in his bowl alone, counting the number of times h swims around in his bowl. Day one, two, and three passes and to his surprise he gets some company. A deep see diver that is actually bubbler. This intruder is weird, creepy, and doesnt speak much thought the goldfish. The next day plants, a snail, a blue crab, and other fishes join the goldfis in his once lonley bowl. The goldfish becomes fustrated and feels very crowded with all these intruders in his bowl. The overwhelmed goldfish wants his bowl back! The goldfish finally gets his wish, but suddenly realizes he misses the intruders and realizes he does not like to be alone. After a lonley night in his bowl all to himself the Gold fish in reunited with companions in a much larger, less crowded, brand new tank. The gold fish no longer feels lonley with his new companions, and he even findsa new girlfriend. Response: I really liked this book. I can remeber feeling the same way when my mother remarried. My home went to just my mother and I to My mother, stepfather, and a new bother. I felt like they were taking ove my home and now I had t share my space. I can rememberbeing angry and fustrated and wishing that I had my space back. My stepfather and stepbrother went out of town for a weekend and I miss them so much. I can recall asking my mom when they were coming back. I feel that the lesson of this book is to teach that sharig our lives and spaces does not have to bothersome, but can lead to a happy and fullfilling life. I enjoyed the illustrations very much. After I read the book once I went back through and only looked at the illustrations and found it amazing how the illustrator shows the feelings of the goldfish through the expressions on the fish's face . Connection to Classroom: According to www.gale.cengage.com/pdf/Teachingbook..., Memories of A Goldfish can be used in an English Language Arts Lesson. Afer reading Memories of A Goldfish the students study the illustrations, especially those of the goldfish's face. The student will have a worksheet that will contain a word bank containing different words to decribes feelings. The students can use these wordsto decribe each expression the fish is feeling. A lesson teaching theh morals of the story can also be used with Memories of A Goldish. Students will list the morals and give supporting evidence for each moral. This will allow the students to think about the story . Summary: Memoirs of a Goldfish By Devin Scillian. This is a very nice picture book that begins with a goldfish swimming in his bowl. After four days the goldfish starts to receive company. Days go by and he eventually ends up in a very crowded bowl. He has no room to swim and he becomes very upset. Eventually one day he is put into a separate but smaller bowl. At first the goldfish is okay with it because he got his space to swim again. Later he starts to think about everyone in the previous bow Summary: Memoirs of a Goldfish By Devin Scillian. This is a very nice picture book that begins with a goldfish swimming in his bowl. After four days the goldfish starts to receive company. Days go by and he eventually ends up in a very crowded bowl. He has no room to swim and he becomes very upset. Eventually one day he is put into a separate but smaller bowl. At first the goldfish is okay with it because he got his space to swim again. Later he starts to think about everyone in the previous bowl and wonders if they miss him too. Finally he gets to be part of his family in a big tank where there is enough room for everyone and he meets another goldfish who enjoys swimming with. The illustrations are beautiful and truly show the emotions that the goldfish is feeling throughout the book. Response: This book has very colorful images that go along with the story very well. The pages vary from short sentences to paragraphs. This story made me feel sad at first and happy in the end. The goldfish is adjusting with whoever or whatever is being put into his bowl. He shows his sadness and how he is helpless to do anything about it. Eventually he gets fed up and wants his own space. I can understand how he feels because sometimes I feel like my space is being invaded and I cannot be rude to anyone so I just deal with it. gives students worksheets that show facial expressions of the fish on each day. Students are asked to guess what the fish is feeling on that day. The activity has a second part in which students will explain the moral of the story. That part is appropriate if students have been exposed to the meaning of morals. I think this is a wonderful lesson plan that can be used to teach students how the moods of the character change according to different situations that the goldfish goes through. 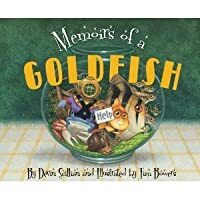 “Memoirs of a Goldfish” by Devin Scillian is a wonderful picture book about a goldfish and his fish bowl home. The story starts on day one with the goldfish swimming around his fish bowl and continuing swimming till day four. On this day, a bubble submarine suit appears that the fish names Mr. Bubbles. Mr. Bubbles creeps the fish out because he doesn’t say anything. 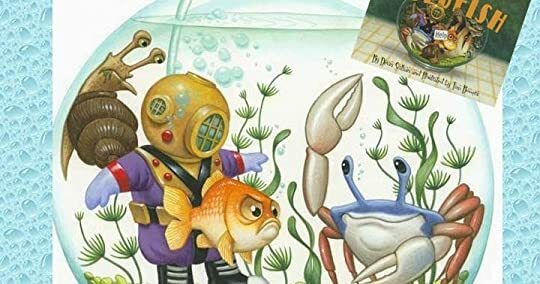 On day six and seven, the fish gets a bunch of plants and even a snail named Mervin that disgusts the fish because he eats slime o “Memoirs of a Goldfish” by Devin Scillian is a wonderful picture book about a goldfish and his fish bowl home. The story starts on day one with the goldfish swimming around his fish bowl and continuing swimming till day four. On this day, a bubble submarine suit appears that the fish names Mr. Bubbles. Mr. Bubbles creeps the fish out because he doesn’t say anything. On day six and seven, the fish gets a bunch of plants and even a snail named Mervin that disgusts the fish because he eats slime off the bowl. On day eight, a crab named Fred shows up, who tries to snip the fish’s tail and on day nine, a pirate ship, an angelfish, and two guppies appear. On day ten, the fish is becoming stressed as he finds out the guppies are expecting babies and the fish has to navigate around the crowded bowl. On day eleven the fish sees his reflection and he looks nothing like his old self. On day twelve, the fish finally explodes and says he wants his bowl back. So come day thirteen, the fish is placed in a new, smaller bowl all to himself. But he realizes quickly that he is worried about everyone from his old bowl and he begins to miss them all. Then on day fourteen, the fish is placed in a bigger tank with all his old friends in it. He is so happy to be back and also realizes that his reflection was a girl goldfish that he invites to come swim around the tank with him. This book is intended for younger audiences due to the simplicity in words and bright, colorful pictures on the pages. It would be a great book for a young child getting a pet fish for the first time because the child can see from the fish’s perspective. It is important to see the goldfish’s perspective because it is unique and good for kids to see how a small pet may feel, introducing new things to its environment. I loved this book because of its sense of humor. The simple titles of “day one, day two” are comical and the fish’s reaction to new toys and fish joining him in his tank is very funny. I also like the moral to the story, where the goldfish realizes that he misses all his new acquaintances and they become a sort of family to the fish. Scillian, D. (2010). Memoirs of a goldfish. Minnesota: Sleeping Bear Press. SUMMARY: Memoirs of a Goldfish by Devin Scillian is a about the life of a goldfish, whose tank is being taken over by several different animals. Written from the fish's point of view, children will love the humor and the things that the fish says as he becomes more and more annoyed by his tank mates. CRITIQUE: Memoirs of a Goldfish would be classified as fantasy if picture books were to go under certain genres because the main character is a talking fish. The setting is a fishbowl, and the different characters are all developed perfectly. Each character has his or her own unique personality, and the characters really help to explain the story better. The plot revolves around the goldfish whose tank has been invaded by all different kinds of plants and decorations and other animals, and the conflict is that the bowl is not big enough for everything and the goldfish is incredibly annoyed. The theme is friendship, because by the end of the story the goldfish has realized that he needs his new bowl mates because he is lonely without them. Scillian was most likely thinking about readers who like their own space when he was writing this book. 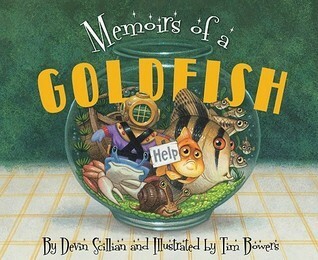 The point of view is first person with the goldfish as the narrator, and Scillian uses voice in order to help the goldfish's character come to life. This book is adorable. It is written as diary entries of Goldfish, who loves swimming alone in his bowl, once, maybe twice a day. Then one day, his bowl gets company, and from that day on, his bowl gets more crowded. Plants, Mr. Bubbles, Mervin the snail, Fred the crab, Rhonda and Clark the guppies, an angel fish named Cha-Cha, are all put into Goldfish’s bowl and he is not happy with it. It is way too crowded and some fish just do not get along with each other. Then all the other fish and crab This book is adorable. It is written as diary entries of Goldfish, who loves swimming alone in his bowl, once, maybe twice a day. Then one day, his bowl gets company, and from that day on, his bowl gets more crowded. Plants, Mr. Bubbles, Mervin the snail, Fred the crab, Rhonda and Clark the guppies, an angel fish named Cha-Cha, are all put into Goldfish’s bowl and he is not happy with it. It is way too crowded and some fish just do not get along with each other. Then all the other fish and crab and snail leave, and Goldfish is lonely. Who will change the baby guppies’ diapers? Who will clean the gunk off the side of the bowl? Goldfish is then moved to a bigger tank and everyone is reunited, along with a new addition of a girl goldfish, Gracie, who Goldfish plans on swimming around the tank with. I think this book would be very appealing to early readers because a goldfish is a common first pet, so students would be able to relate to the story and connect with the goldfish. The pictures were very appealing and the writing was a larger size for easy visibility. This book could be used to teach about different families and how not everyone in a family is necessarily related. 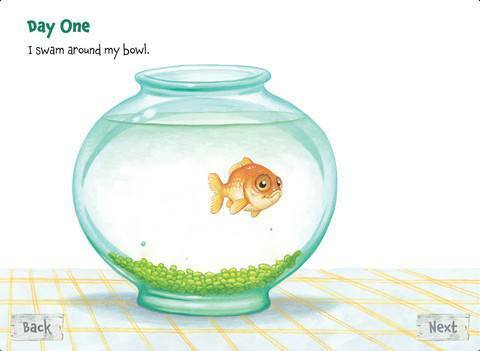 The book also had a great sense of humor with the “Day One” and “Day two” entry titles, and Goldfish’s expression and reaction to the new company in his fish tank is very funny. After reading this story, students could create their own story about a pet being put into a new environment or describe how they feel about moving, changing schools, etc. Scillian, D., & Bowers, T. (2010). Memoirs of a goldfish. Ann Arbor, MI: Sleeping Bear Press. Think: I will prompt the students with a question they can think about quietly. "Have any of you ever had to share a room with a sibling? Or felt like your house was packed with people and all you wanted was some alone time? Have you ever been so irritated with the people around you because you had no personal space? Think of a time when you have felt like this. Pair: Now turn to your table partners or shoulder partner and share with the group a time when you have felt like this. Be sure to include how it made you feel and how you handled those feelings or that situation. Share: Share with the group a time when you have felt like this. Be sure to include how it made you feel and how you handled those feelings or that situation. Did you feel sad and lonely like Goldfish did? Conclude: Even though we may be irritated, annoyed, or mad at our families we still love them and wouldn't want them to leave us. It's nice to have people around that care about one another. Goldfish is very content by spending his days swimming around in his bowl. As Goldfish tells us of his adventures he has every day (such as swimming around his bowl the first day, and swimming around twice the second day) the reader gets a good laugh at his simple life. Things aren't so simple once Goldfish begins to gain some company - first Mr. Bubbles, then Mervin, Fred, and all the others. Goldfish does NOT like sharing his bowl with everyone! He finally gets his wish to be all alone again, Goldfish is very content by spending his days swimming around in his bowl. As Goldfish tells us of his adventures he has every day (such as swimming around his bowl the first day, and swimming around twice the second day) the reader gets a good laugh at his simple life. Things aren't so simple once Goldfish begins to gain some company - first Mr. Bubbles, then Mervin, Fred, and all the others. Goldfish does NOT like sharing his bowl with everyone! He finally gets his wish to be all alone again, but he discovers it's not all it's cracked up to be - especially once he sees how the others are becoming his family. Devin Scillian brings an adorable and funny story to life in Memoirs of a Goldfish. This was an excellent book! It expanded awareness and was original by letting the reader into the life of a goldfish who has his world turned upside down. It's a great read that makes you laugh and want more and it doesn't teach or moralize, other than showing that it's not that bad when there are others with you in your "family." It tells the truth in this issue, and has integrity and quality, all coming together for an excellent story. Memoirs of a Goldfish was such a funny and heartwarming read! It's written as a daily account of Mr. Goldfish's tank being invaded by new decorations/plants/fish. I really like that the author chose to tell the story in journal form, the frankness of the entries elicited many laughs out of both my husband and I & especially our children. The illustrations are very adorable; the big, bug eyes on the fish and the wispy, lifelike plants were perfect. As the bowl gets filled up we even zoom in on Memoirs of a Goldfish was such a funny and heartwarming read! It's written as a daily account of Mr. Goldfish's tank being invaded by new decorations/plants/fish. I really like that the author chose to tell the story in journal form, the frankness of the entries elicited many laughs out of both my husband and I & especially our children. The illustrations are very adorable; the big, bug eyes on the fish and the wispy, lifelike plants were perfect. As the bowl gets filled up we even zoom in on the tank and it definitely lends to a claustrophobic feeling. Not only do we zoom in but the pages also get way more colourful and cheery. Once Goldfish is taken out of his tank for a cleaning the canvas is once again very white and colourless. I loved how well the illustrations conveyed the emotions of the writing, they were spot on in every possible way. This is the story of a goldfish who happily lives in a bowl by himself. But gradually, his bowl get more and more crowded with intruders. It's a story about community and friendship, and how people are better off living in community with others even if those people get on your nerves every once in a while. It's a very positive and adorable book with a neat, happy ending and concise text. This book could be used to learn about animals, particularly fish or pets, and of course has great lessons abo This is the story of a goldfish who happily lives in a bowl by himself. But gradually, his bowl get more and more crowded with intruders. It's a story about community and friendship, and how people are better off living in community with others even if those people get on your nerves every once in a while. It's a very positive and adorable book with a neat, happy ending and concise text. This book could be used to learn about animals, particularly fish or pets, and of course has great lessons about being a responsible member of a family or community. I only had one problem with the book, and that was with the goldfish's claim that fish don't sleep. False. Fish do sleep, only they do it with their eyes open. Audience: This book would be appropriate for boys or girls. I think second or third graders would be the best students to read this book to. Some of the humor in this book might be lost on younger readers. It would be an easy read for these grade levels, vocabulary-wise, so it would be a good choice for those who struggle with reading. Appeal: This book is definitely humorous. It would be a very entertaining book for students. It has bright, vivid pictures with a lot going on. Application: I woul Audience: This book would be appropriate for boys or girls. I think second or third graders would be the best students to read this book to. Some of the humor in this book might be lost on younger readers. It would be an easy read for these grade levels, vocabulary-wise, so it would be a good choice for those who struggle with reading. Application: I would use this book to start a discussion about pets we have or maybe even how we feel when we don't have our own space. This book would also be good to do a picture walk with. There are so many things going on in each picture, so the kids could have fun deciphering the pictures, then enjoy the jokes while you go back and read the story. "Today we are going to read "Memoirs of a Goldfish," just from the title whose point of view do you think this book will be from? What kind of experience do you think this book maybe about?" Alert children to unusual features of the text such as its structure or narrator. I drew attention to the fact that the book is from the perspective of a goldfish. "Today we are going to read "Memoirs of a Goldfish," just from the title whose point of view do you think this book will be from? Alert children to unusual features of the text such as its structure or narrator. I drew attention to the fact that the book is from the perspective of a goldfish. Tell the meaning of a key word. Memoir is not a common word and a large number of children may never have heard it. This is the story of a goldfish who gives readers a firsthand account of his life in a crowded fishbowl, but soon realizes that being surrounded by others is better than being all alone. The illustration on the cover of this book (a sad goldfish crammed into a bowl and holding up a sign that says “help,”) along with the bold type of the title, was very eye-catching, and I had to read Scillian, D., & Bowers, T. (2010). Memoirs of a goldfish. Ann Arbor, MI: Sleeping Bear Press. Great book in a sort of diary form that tracks two weeks in the life of a goldfish. Swimming in a solitary tank, he must adapt as his life changes and new items clutter his world. A diver, a snail, guppies of the verge of spawning aggravate our goldfish and he longs for the solitude of his empty tank. For some reason, everything disappears and he finds himself alone getting his longed for wish of solitude and somehow doesn't enjoy it as much as he remembered. Wonderful way to teach about appreci Great book in a sort of diary form that tracks two weeks in the life of a goldfish. Swimming in a solitary tank, he must adapt as his life changes and new items clutter his world. A diver, a snail, guppies of the verge of spawning aggravate our goldfish and he longs for the solitude of his empty tank. For some reason, everything disappears and he finds himself alone getting his longed for wish of solitude and somehow doesn't enjoy it as much as he remembered. Wonderful way to teach about appreciating what we have, when we get it, and enjoy it for simply what it is. 3.25 stars This books makes me want to get another fish. My last fished died probably last summer...a beta..and I just needed a break for awhile..now I am thinking I could at least walk around the pet store. Maybe a turtle that will only get the seize of my hand. This is about fish in an over crowded tank and the life of a goldfish. Adorable! Day One: I swam around my bowl. Day Two: I swam around my bowl. Twice. Goldfish loves his life. Until his simple bowl is invaded, daily, by a creepy bubble man, a disgusting snail who eats slime, a crab, and guppies who will be multiplying. He just wants his bowl back - or does he? A fun look at what makes up a family setting! 33 month - We've read this a ton of times over the past couple of weeks (from the library). A+ for an original story and great illustrations. I think we'll have to borrow this again when we reach our week all about the letter "G". Too cute. Have you ever wondered what it was like to be the only goldfish in the tank? What happens when you start getting more, and more, and more. You just want your little bowl all to yourself again ... maybe. One of my absolute favorite kids books! !